I love making phone calls. I always jump at the chance to make phone calls to Pittsburgh Theological Seminary alums and friends. While talking with people on the phone, they always ask, “so, what degree program are you in?” As a graduate student, I get asked this question quite frequently. My answer, however, is unexpected and different from most seminarians. Not only am I getting a Master of Divinity from PTS, I am also getting a Master of Social Work from the University of Pittsburgh. Currently, I am in my third year at PTS and my first year at Pitt. I initially decided to start the MDiv/MSW dual degree program because I want more practical knowledge and skills for pastoral care. I feel called to be a hospice chaplain, and I figured that completing the MDiv/MSW dual degree program would give me extra preparation for chaplaincy. I was surprised after I started both degree programs that social work and theology work well together. Completing both degrees has helped me to understand the world and myself in a different ways. Through classes in both programs, I have learned what it means to serve “the least of these.” From classes at the Seminary like “Church and Society” and classes at Pitt like “Diverse Populations,” I’ve begun learning about the vast number of cultures and influences in different groups of people. I’ve learned about the need for cultural competence and understanding in ministry and social work practice. In ministry, it is essential to understand your own culture as well as the culture of the people you are working with. The MDiv and MSW programs have led me to have a better theological understanding of Christ’s mission of reconciliation. In my “Diverse Populations” class, I learned about the different types of oppression people experience in the world. Being a part of Christ’s mission of reconciliation means breaking down systems of oppression in society and internalized oppression. The MDiv and MSW programs have forced me to step out of my comfort zone and see what personal biases I have and need to overcome. These programs have stretched me and encouraged me to work with people who experience oppression. Most of the clients I work with at my MSW internship are older adults who experience ageism and have a lack of resources. All of my field work in the MDiv and MSW programs continue to prepare me for working with a wide variety of populations. Being a graduate student at two schools comes with a lot of stress and a heavy course load. Many people have asked me, “is it all worth it?” I personally believe that getting these two degrees is worth it. Just in this short amount of time, I have learned so much about theology and how it applies to everyday life. I have learned concrete skills and techniques that can help me be a part of Christ’s mission of reconciliation. Whether I am a chaplain or social work practitioner, I feel so blessed to have the opportunity to learn so much about God, the world, and myself. 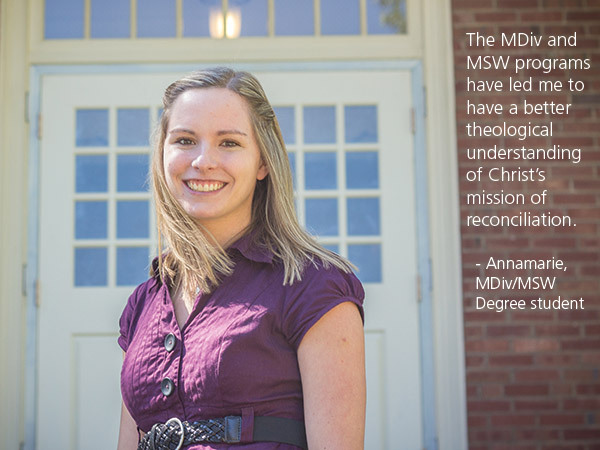 Annamarie Groenenboom is a senior MDiv/MSW student at Pittsburgh Theological Seminary and the University of Pittsburgh School of Social Work. She is a Hartford Fellow at Pitt and focuses on gerontology. She is completing her internship at Harmar Village Care Center and looks forward to using her joint degree to be a hospice chaplain. When not studying she likes to spend time with her husband, read Harry Potter, and crochet. I began my graduate studies as a student of the University of Pittsburgh working to receive my masters of social work (MSW). The course work was practical problem solving for those with mental health, social, and justice issues. It was exciting to be learning about how government programs work and how to best serve those with mental illness. I was fascinated by my classes in cognitive-behavioral therapy and dialectical behavioral therapy. I could not get enough. In my second semester I was required to do my first internship. I began working as an in-home family therapist. It was wonderful work, coming alongside a child, and therefore a family, to offer services to better the life of the family and child. In this work I got to travel all around the city of Pittsburgh. I worked with families that were very affluent and some that were the poorest of the poor. In all of it, my education, matched with outstanding supervisors, gave me the confidence to enter any situation, face it, and do my best to improve the lives of those I was working with and for. As I entered my second year of graduate school, a more intense internship was required. I began working at a step-down program for children and youth exiting the psychiatric hospital and slowly transitioning back to school. There I had to apply what I was learning in a completely different way. Theologically, I was not ready to proceed. And I could not proceed. Working in a large conglomerate system does not allow for personal religious beliefs and frankly, neither does therapy. It is about working out the problems of the client and helping the client achieve mental health. For this young man, I can say that I did the best I possibly could. We worked on his problems and my hope is that he is a well-adjusted man today. But personally, I knew I had to go back to the drawing board. My MSW was not enough. I needed a theological education that would provide a foundation for all of my practical and theoretical knowledge. And that is why I then began attending Pittsburgh Theological Seminary, earning my MDiv through the PTS/Pitt joint degree program. I graduated with both degrees in 2005 and have found the mixture of practical and theoretical knowledge perfectly supported by my theological education. 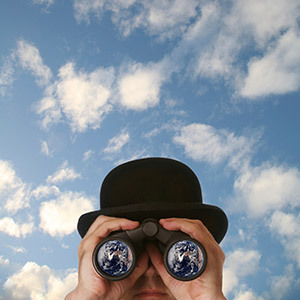 Being able to see the world and the great, tragic problems of the world, through the lens of my theological education gives me great eschatological hope. And great practical hope. The lens through which I understand God and our human interactions with God does not get clearer every day, if anything it gets foggier. But having both an MSW and an MDiv allows me a clarity that one alone did not. Immigration is a ministry of social work. Jesus conjoined the commands in Deuteronomy 6:5 and Leviticus 19:8 in response to the question posed by a Scribe: “What is the greatest commandment?” The result found in Matthew 22:37-39 is, “You shall love the Lord your God with all your heart, and with all your soul and with all your mind. This is the greatest and first commandment. And a second is like it: You shall love your neighbor as yourself.” This second command is the cornerstone text used by Christians in support of immigration reform. Just as Jesus came among us (Emmanuel) one can only fully understand the lives of migrants by being among them. Through a World Mission Initiative cross-cultural trip, MDiv, MDiv/MSW and MA program students at Pittsburgh Theological Seminary have taken a look at the immigration issue up close and personal. In the past, I’ve led a team to Agua Prieta, Mexico, a town just across the border from Douglas, Ariz. The Presbyterian border mission, Frontera de Cristo, hosted us. For a week, we worshiped and fellowshipped with residents of the town, visited mequiladora factories, lived on a day’s wage of a mequila worker, and shared a meal with migrant workers. Some of them were attempting to cross the border for the first time while others lived in the US for years before deportation. We walked along the pathways in the desert where many have traveled in the cover of darkness escaping the watchful eyes of Border Patrol, listened to the testimonies of clients of C.R.R.E.D.A, a drug and alcohol recovery center, who as part of their recovery fill water buffaloes in the desert for migrants. But perhaps most riveting was the weekly prayer service for the men, women, boys, and girls who lost their lives attempting to cross the border. 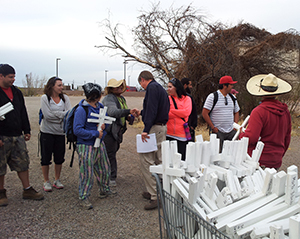 In good or bad weather, a group of the faithful gather in the parking lot of a McDonalds behind a van full of white hand-made crosses with the names, date of birth, and date of death of the persons found in the desert. If the person could not be identified, the cross would simply say, “No Identificado.” Each of us with an arm full of crosses, paraded down the Avenue of the Americas and one by one, called out the name of the person on our cross and shouted, “Presente!” as we stood in surrogacy. Afterwards we laid the cross on the curb. The result—a line of more than 100 white crosses dotting the curbside of the Avenue of the Americas lighting the way to the border checkpoint. 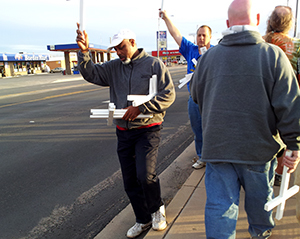 One cannot look at the issue of immigration without looking at the cross. The Rev. John Welch is a 2002 graduate of Pittsburgh Theological Seminary. He earned his MDiv degree, served in parish ministry at Bidwell United Presbyterian Church in Pittsburgh, and is now the Seminary’s vice president of student services.